Amoxi-Tabs (amoxicillin) is a semisynthetic antibiotic with a broad spectrum of activity. Amoxi-Tabs (amoxicillin) is a broad-spectrum penicillin antibiotic designed for both canine and feline use. It is a semi-synthetic drug used to treat a wide range of infections caused by gram-positive and gram-negative pathogens. Side effects when using amoxicillin include loss of appetite, nausea, vomiting or diarrhea. Allergy to this type of drug is fairly common, symptoms of which include rash, fever, swelling of face or limbs, difficulty breathing, rapid heart beat and incoordination; the treatment for serious allergic reaction is epinephrine or steroids. 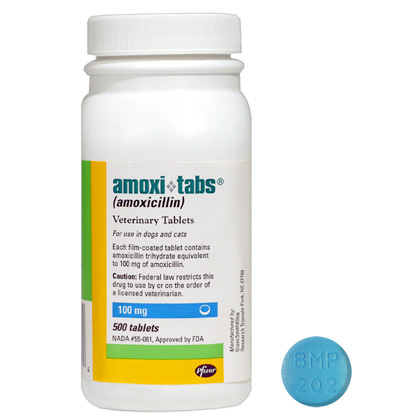 Amoxi-Tabs should also be used carefully when prescribed for a pet simultaneously using other medication.